Maple Ridge Dad: "I stress about not making enough"
Rachel Jensen and Ryan Rasmussen slip into the red every month of their lives. The Maple Ridge couple need to start operating in the black — and they need to do it soon. 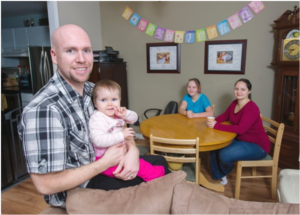 Ryan Rasmussen and Rachel Jensen, November 25th, and their children, Emma Jensen 11 years and Ava Rasmussen 1 year, in their Maple Ridge home The couple are hoping to teach the children to be financially responsible. Rachel is expecting her third child next spring. The couple tried drawing up a budget but their money kept falling through their fingers. So they turned to the non-profit Credit Counselling Society for guidance. During the next 12 months, the society will give Jensen and Rasmussen a money makeover. Watching their progress will be the Credit Counselling Society, who will monitor their spending, and The Sunday Province who will report on the family’s struggles and, hopefully, success every three months for the next year. If the couple meets most of their goals, investment management firm Phillips, Hager & North has agreed to make an RRSP contribution of $5,000 to the couple. We invite our readers to wish them well, weigh-in, and follow their money makeover. Money worries have pushed Ryan Rasmussen to his wits’ end. The Maple Ridge resident frets about the gap between what his family earns and what it spends. He fears the gap will widen next April when his next child is born, his wife goes on maternity leave and family expenses climb. “I try to be as mellow and laid back as possible but money has become a big worry for me,” Rasmussen says. Rasmussen, 30, and his wife, Rachel Jensen, 32, struggle with the two pillars of debt that shadow the lives of many young B.C. families. One of those debts is the $227,623 mortgage on the townhouse they share with daughters Ava, 1, and Emma, 11. The other is unsecured credit debt that includes a $13,130 line of credit and a $2,300 bank overdraft. They’ve tried to make a dint in this debt but have had little luck. Their budgets have been busts. Their debt keeps growing. Under their current monthly budget, they’ve got expenses of $5,762 and an income of $5,539. In other words, they’re short $223 each month. “If they follow this budget, they’re going to go deeper into the red every month and they’ll have to use credit to make up the difference,” says Monica Loeppky, a counsellor with the Credit Counselling Society. That may be about to stop. Rasmussen and Jensen have committed to a 12-month money makeover by the non-profit Credit Counselling Society. Each month, Rasmussen and Jensen will meet with Loeppky to monitor their progress in leaving the credit crutch behind and learning to live on cash. “We will work with the family to embrace good money habits, learn to separate needs from wants and work toward goals,” society president Scott Hannah says. The couple will have to show determination, a willingness to sacrifice and sustained effort to succeed, Hannah says. “If they’re diligent about staying on track, in five to 10 years they may still have a mortgage but should be in a much better financial position,” Loeppky says. Employment: Rachel works as a claims contact adjuster with ICBC. Ryan is production supervisor with Source Floor & Specialties, a commercial floor covering company based in Coquitlam. Income: Together they take home $5,539 a month. Up to $5,000 is earned during the winter when Rasmussen does extra work installing flooring. Expenses: Their basic monthly costs are $5,762. They’re making up most of the $223 difference by temporarily shelving their plan to save $200 a month for home repairs. Assets: Townhouse ($250,0000), two vehicles, an RRSP, a small GIC and a little cash in savings. Total: $298,330. LIabilities: Mortgage ($227,623), vehicle loan ($31,000), line of credit ($13,130), overdraft ($2,300), credit cards ($429) parental loan ($10,000). Total: $284,482. The Credit Counselling Society has asked Rasmussen and Jensen to open three accounts as a first step in getting their financial house in order: One for fixed monthly expenses, one for irregular or annual expenses and a third for cash or personal expenses. “This will give them the ability to manage their money more closely and keep an eye on where things are going,” society counsellor Monica Loeppky says. “It gives more structure to their spending. It also means they won’t be able to spend money if it’s not there. Their credit cards are to be cleared to zero and to be used only for convenience: No further debt to be accrued. “When the money is gone, it’s gone. They won’t be able to use credit,” Loeppky says. As they start their makeover, Rasmussen and Jensen have been asked to track a few expenses: food and items such as toiletries, household sundries and baby needs. How are they going to deal with the $223 gap between income and expenses? For now, they will cut the $200 a month earmarked for townhouse repairs. The $75 a month they are starting to set aside for gifts won’t be enough for Christmas, so money from Rasmussen’s side job will make up the difference.